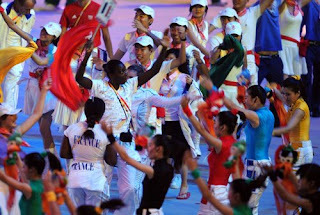 Beijing Olympic 2008 has ended with magnificent closing ceremony on 24th August 2008. I watched the ceremony last night and I wished I could be there. It was colourful and fun. After so many years of anticipating, China had showed the world what she had to offer. At the closing ceremony, all the athletes looked like they were having fun at the Bird Nest. I saw people from all around the world, gathered in a stadium celebrating a wonderful event. It truly reflected the theme of the Beijing Olympic, ‘One World, One Dream.’ Through sports, people gathered in one place for the mere 16 days and compete for glory. There was no conflict among them. Why can’t the world be like this? Why do stronger countries have to invade or attack smaller nations? How nice it would be if there is no war or conflicts in the world. For the past 2 weeks that I watched the Olympics, I saw Diving, Boxing, Weight Lifting, etc. These are the sports that I wouldn’t have the chance to watch if it wasn’t for Olympics. I guess we only have chance to watch these sports once every four years. Or, perhaps we can see them at Asian Games or Southeast Asian Games too. Sometimes I wonder what the purposes of these sports are. I think, for athletes, they all aim for the gold. But I don’t know why countries like China and USA always fight to be number one in the Olympics. So what if they are number one? Sometimes watching them fight over number one provides some excitement when we watch the games. I’m glad that China won 51 gold and be on the top of the chart. It is the pride of all Chinese in the world. Well done! The show has come to an end. The world is now looking forward to London Olympic 2012. Judging by the brief performance by London at the Closing Ceremony of Beijing Olympics, I’m sure we can expect an awesome Olympics from London. Yor! Can I copy your post to my essay? aha! How come never update 1..
U want to copy it as your homework? Cannot! !